Peter Hetherston, a player who was destined to become a Raith Rovers legend, put pen to paper in a £20,000 deal taking him from Falkirk to Stark’s Park 28 years ago. It was the first of two spells in Kirkcaldy for the midfielder, where he would go on to make 108 appearances, scoring 10 goals. First Division Rovers splashed out £20,000 for 27-year-old Hetherston in October 1991 and the Fife Free Press revealed he could be pitched in to first team action straight away in a clash against Forfar Athletic. The FFP said - Hetherston watched his new team mates defeat Clydebank on Tuesday and could play from the start against Forfar. 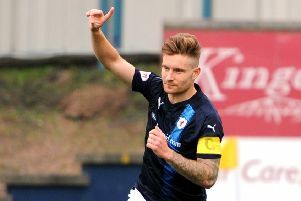 He was a key figure in Falkirk’s championship-winning squad last season but drifted out of the picture after a contractual dispute – and he jumped at the chance of a move to Kirkcaldy. “I had offers from a couple of clubs, but the manager really sold Raith to me,” he said. Hetherston embraced by a fan after Raith won the First Division title in 1993. As a Bairn, Hetherston was a thorn in Rovers’ flesh on many occasions – he scored twice in the infamous 7-1 hammering at Brockville last season – and his experience should be an asset to the Stark’s Park side. He spent 18 months south of the border with Watford and Sheffield United before joining Falkirk. “We always looked forward to playing Raith,” he said, “they beat us at home when we were flying high, and then knocked us out of the B&Q Cup. Hetherston is looking forward to bouncing back into first-team football, even in the less glamorous surroundings of Station Park. “If you want to win league titles or mount a challenge, you have got to take points from places like Forfar. They always make life hard,” he said. Nicholl rates the trip as one of Rovers most physically demanding fixtures, but the arrival of Hetherston could give the entire squad a lift. “I am delighted he chose Raith, because he had several offers,” said Nicholl. “He is a clever player who uses the ball well, and has a lot of pace. Just recently we have not been direct enough in the final third of the park, and that is where I want him to really buzz. The manager, meanwhile, still has a number of injury problems to contend with. Martin Nelson picked up a knee injury at Kilbowie, while Alan Mackenzie’s groin strain could keep him on the sidelines this weekend. On the positive side, Shaun Dennis will be available again after his midweek international duties, while David Sinclair is free from suspension, and, in the words of the boss, “desperate for a game”. Rovers face a series of three away matches before entertaining Partick on October 29 – they visit Morton in the B&Q Cup quarter-finals on Tuesday, and then travel to Stirling next Saturday – and Nicholl is hoping that success on the road will re-kindle the sullen atmosphere at Stark’s Park. “I want a handful of points in the bag and a place in the semi finals – and then perhaps the home fans will realise what the team can do,” he said. “I was grateful for a point last weekend – it set us up for the game at Clydebank where the players knocked the ball about and looked quite good, even after losing an early goal. Nicholl also paid tribute to the fans who travelled to rain-soaked Kilbowie. “The players appreciate their support.” He said. Hetherston stayed with Rovers until 1994 when his excellent form was rewarded with a transfer to premier league Aberdeen. He returned to Raith for a second two-year spell in 1999 when he was appointed player/manager. It wasn’t the best of times for either Hetherston or the club but it did little to damage his legendary status among the Kirkcaldy faithful and in 2016 he was inducted into the Raith Rovers’ Hall of Fame.